By far the most popular Off-Road Adventure Tour in the Las Vegas area is the Vegas Mini Baja Chase with Sunbuggy Fun Rentals. The Mini Baja Chase is fast-paced and not tailored for the weak at heart. This is the Las Vegas Driving Experience you've likely seen on TV as the Vegas Mini Baja Chase has been featured by several different TV networks from around the world. The heart-pounding chase was billed as "Sin City's Best Near Death Experience!" by Rolling Stone Magazine. THIS IS NOT A SLOW PACED OFF ROAD SIGHTSEEING TOUR (if you'd like slow and pretty we can take you to the Valley Of Fire instead) Your job will be to chase one of our expert Dunies. The only thing that will slow our Dunie down is if he's waiting for you to catch up. At SunBuggy, although we regularly host large events with hundreds of participants, the Mini Baja Chase is kept to less than 7 cars per Dunie to ENSURE that you get a nice fast ride! During your Off-Road adventure you will travel over very aggressive and challenging terrain. The Vegas Dunes Off-Road recreation area consists of dunes, gravel, hard pack, hills, valleys, washed out creek beds, and trails running in every direction. The Vegas Dunes Off-Road area is very technical, and is used by several off-road racing organizations such as SNORE, SCORE, MRAN, and Best in the Desert. This is similar to a roller coaster ride, except you're DRIVING! You sit inside a fully welded double loop steel roll cage and are required to wear a full face helmet and a 4-point harness at all times on the Off-Road course. 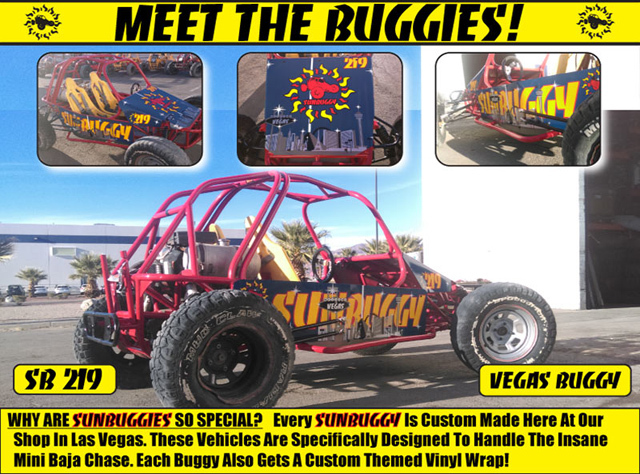 Typically 1 and 2 seat buggies are best suited for the Mini-Baja, however we do have larger buggies available for families to bring the kids, see our Las Vegas Family Fun Romp. While our custom buggies are expert at taming this type of Off-Road terrain, you need not be. They're easy to drive with only gas, brake, and steering - just like your automatic car. We make these buggies tough so you can really put them to it. Just remember, it's your tour: you can go as fast as you feel comfortable. Minimum age to ride as a passenger is 4 years old. Everyone must wear a full face off road helmet during their adventure. Pricing is all inclusive which provides for complimentary round trip transportation from your resort of choice anywhere in Las Vegas. Special Pick Up times may be available by request. this adventure is: 15,000 acres of varied high desert terrain, right on the edge of Las Vegas, only 15 miles from the strip. in the drivers seat, with a steering wheel! without a "Racing Driving Coach" sitting next to you telling you to slow down. includes helmet, goggles, gas, and cold bottled water (no extra extras waiting to surprise you!) Racers have a Full Roll Cage and 4 Point Harness. several times longer than other so called Race Driving Experiences and certainly much much more intense. THE LAS VEGAS MINI BAJA CHASE IS A HIGH INTENSITY TIMED EVENT AVAILABLE IN 1/4 CHASE 30 MIN, 1/2 CHASE 60 MIN, OR 120 MINUTE FULL CHASE. FOR MOST PEOPLE THE 1/4 CHASE 30 MINUTES OF RACE DRIVING INTENSITY IS A GOOD RUN, THE 60 MINUTE HALF CHASE OFFERS AN EVEN BETTER VALUE AND REALLY LEAVE YOU AMPED, AND A WHOLE CHASE IS 120 MINUTES OF DESERT RACING INSANITY WHICH IS GOOD IF YOU'RE LIVING LIKE THERE'S NO TOMORROW!